The cards arrived today, one day earlier than last year. 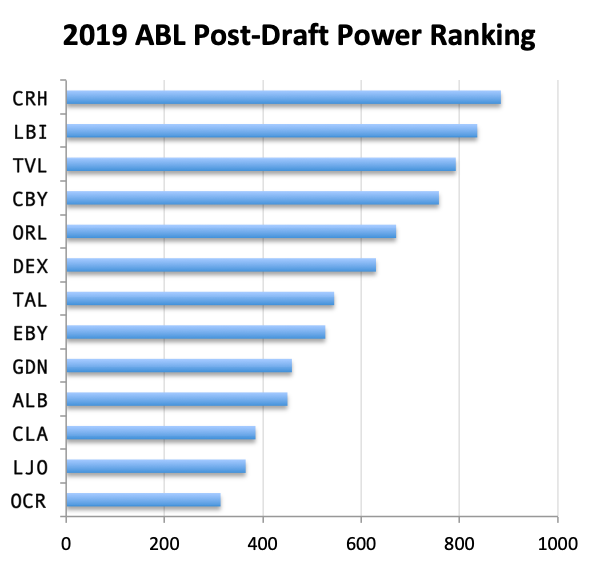 Are the ABL reliever usage limits realistic? One way to try to answer this is to ask the question: “What percentage of 2008 MLB relief appearances would have violated the 2009 ABL rules?” If the answer is “0%,” then I’d say the ABL rules are too lenient in allowing relievers to pitch a lot. At the other extreme, if the answer is “50%,” then I’d say the ABL rules are too strict and don’t allow pitchers to pitch enough. What’s the right percentage that would make you feel that the ABL rules are just about right? 1%? 5%? 10%? More? Note: Short cannot pitch more than 4 IP’s unless no other pitchers are available. Note: Closer cannot pitch more than 3 IP’s unless no other pitchers are available. 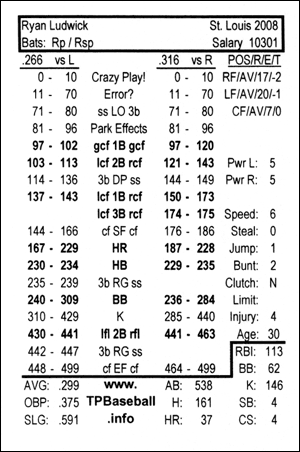 A companion to the average batter card, here is the average pitcher card. This is a bit of a hack—there’s no adjustment between starters & relievers. The pool is 107 pitchers, made up from the best of the draft, the Perfectos, and most pitchers from the teams I’ve played so far. Both pitching squads were sharp. Simmons homered in the 3rd to provide the edge for the Cards. Series stands at 3-2 New York. 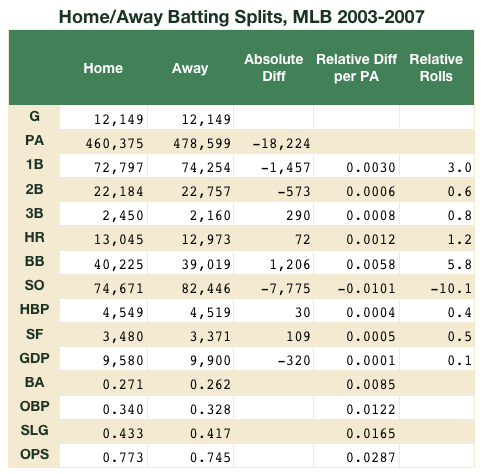 The biggest effect is that the home team strikes out less. The next largest is more walks for the home team. To capture these effects, we need at least 12 rolls, which is an almost perfect fit into the 16 Park Effects rolls, something suggested by the Commish. A possible Park Effects replacement chart appears below. Since the Park Effects range is identical for every batter, we can eliminate the second roll and simply read the result from the original roll that landed us on Park Effects. I worked in a couple of things that don’t otherwise tend to happen in the ABL: infield pop outs (pointed out by cnc14) and extra advancement on hits. One could argue that the home team should have a few SF rolls to account for the extra sac-fly production. This chart would produce a little more offense. 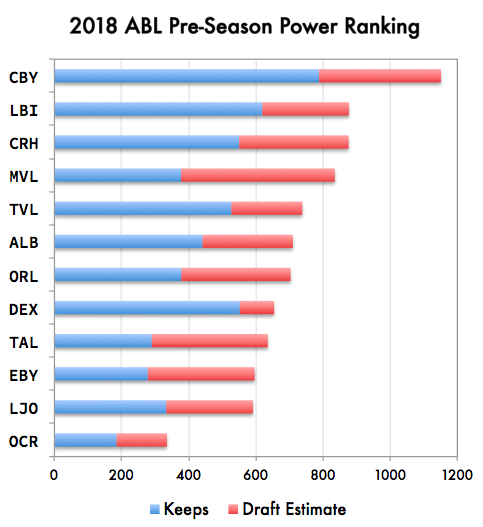 A quick calculation shows that a Park Effects roll on this new chart would yield an average of 0.6 bases per roll, whereas the TBP chart yields only about 0.3 bases per Park Effects roll. I adjusted my rating method to take average pitcher symbols into account on the batters’ cards. As expected, the effect is most profound for guys with big walk & HR ranges, as can be seen for a few guys in the table below. “Before” means pitcher symbols were not taken into account; “after” means they were taken into account. 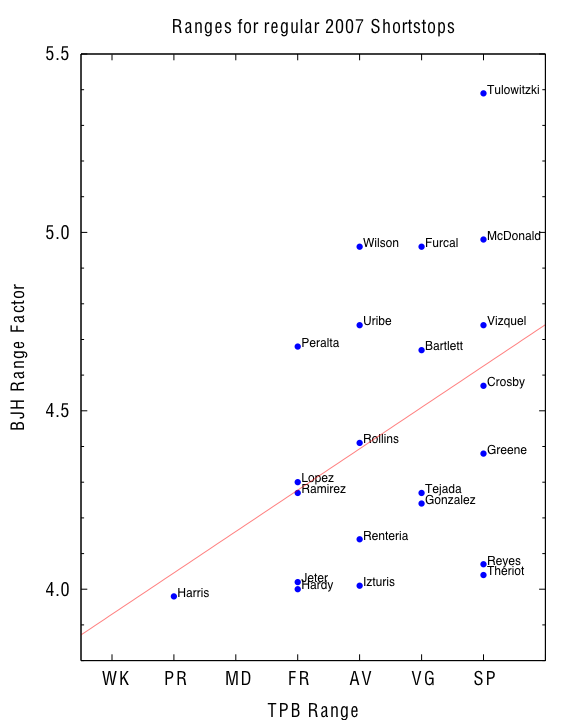 The higher-rated players will have bigger differences, simply because lots of homers & walks make them highly rated. Of course, nothing changed in the cards, it’s just that I overrated the batters. Assuming my current ratings are much more accurate, I overrated Burrell’s performance by 7.4%, not an insignificant amount! For a calculation, I need to know the symbol content of the average pitcher. I did the starters and relievers separately, using the ABL pitchers. Say that of 53 likely ABL starters, 19 have a B symbol. That means that the average starter has 19/53 (0.36) of a B. 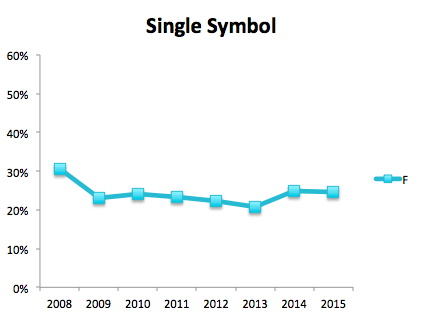 The chart below shows the averages for all the symbols. 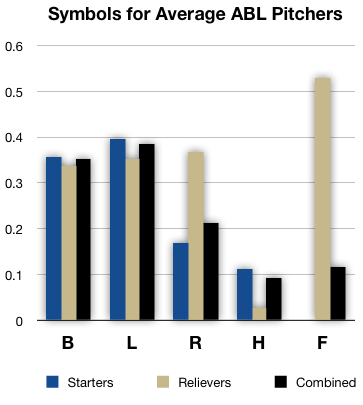 Starters & relievers are combined in a ratio of 7:2, to estimate the pitching over an entire game. 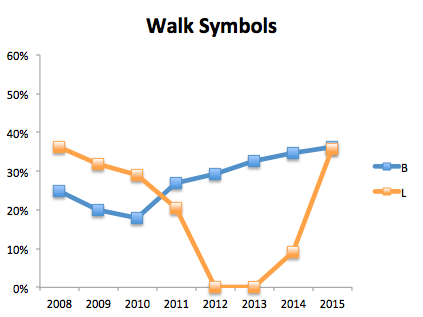 Starters & relievers are quite comparable in terms of the walk symbols, B & L. Relievers have a definite edge for the runners-on symbols, R & H. Not surprisingly, only relievers have Fs. This is a first step toward measuring defensive in terms of offense. The question to answer is: how much good hitting makes up for poor fielding? Or, to look at it from the other side, to what extent does superior glove work compensate for light hitting? There are two components to defense: error and range. Let’s consider error rating only for the moment. And let’s hope my logic is correct. For one PA of his own, a player will be in the field for approximately nine PAs by the opponent. For one opponent PA, the chance of rolling a possible error is 6.3%, which is 60 rolls on 11-70 plus about 20% of the 16 rolls on 81-96 (Park Effects). A possible error will fall on our guy’s position 10% of the time. So, over 9 opponent PAs, the average number of possible errors for our guy will be 9 * 6.3% * 10% = 0.057, which is equivalent to 57 rolls. Now we have to consider specific positions. 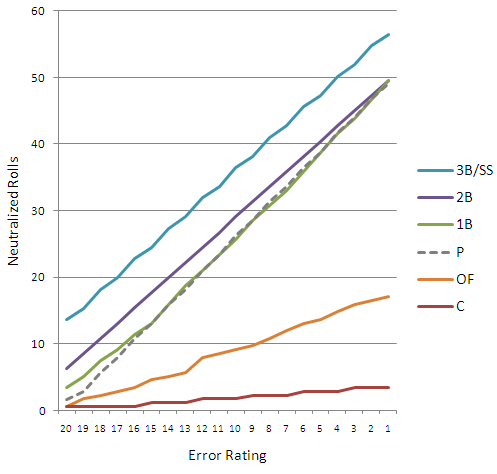 Let’s look at 3B/SS, where errors occur the most, and let’s consider the most extreme difference in error ratings. On a possible error, an error-20 thirdbaseman (Jeff Cirillo) will make an error 24% of the time, while an error-1 (Ryan Braun) will boot it 99% of the time. Let’s ignore the more complex outcomes (E(2), 1B+E(1), RG+) and just say that an error is equivalent to a single. In other words, an error made on defense neutralizes a single hit by the same guy on offense. The 57 rolls calculated above will work out to 14 rolls for a Cirillo error/single and 56 rolls for a Braun error/single, a difference of 42 rolls. One could use these results to adjust a player’s offensive rating. 14 of Cirillo’s average 25 1B range are neutralized by his errors. Via linear weights, Braun’s 56 neutralized singles are equivalent to 18 neutralized HR rolls. (Braun has a 95 HR range vs. L, 35 vs. R.) You could also do a comparison and say that Braun would have to have 42 more 1B rolls (or 14 more HR rolls, or equivalent) than Cirillo to make him equal value, all other things (range, power, etc.) being equal. These “neutralized rolls” can be similarly calculated for other positions and all the error ratings. The results are plotted in the graph below. I didn’t count E(0)s (dropped fouls) as errors on the catcher. The numbers in the chart are just approximations, and each position’s accuracy is different. For example, all the catcher errors counted are of the two-base variety. Anyway, it’s a start. It’s interesting that, with the exception of the catcher & outfielders, all the lines are nearly parallel. 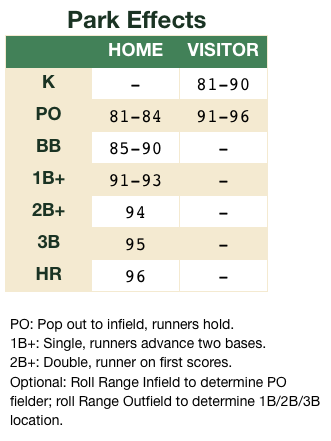 So the difference between an error-20 & an error-1 at a given position is pretty much the same for either 1B, 2B, SS, 3B, or P.
Using the rating data (the best half of the free agents plus the Titusville roster), an average batter card can be calculated. You can see why lefty pitchers can have a hard time. For the ABL draft & season I’ll develop some ratings based on the card ranges. The batter’s card is pretty straightforward. 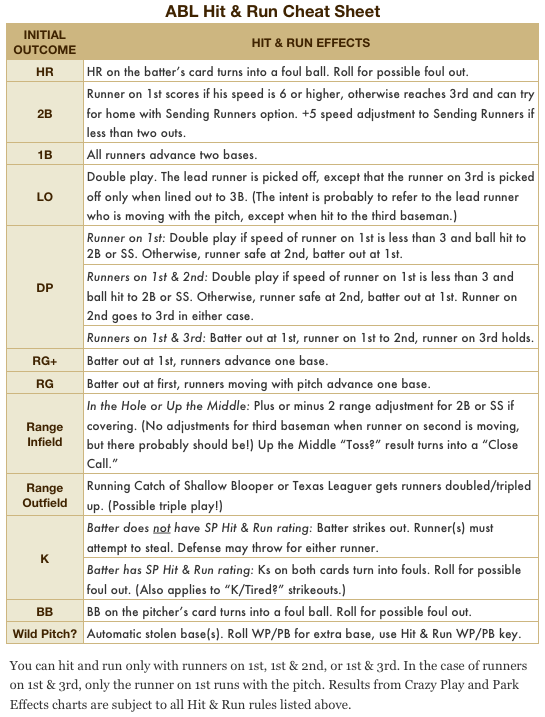 The ranges can be used to directly compute things like OBP & Slugging that are independent of pitcher-card rolls. 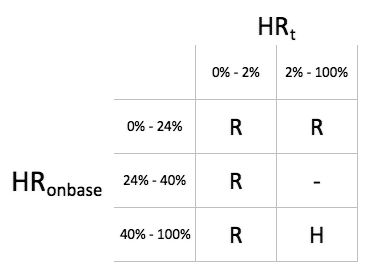 The one vital correction, however, is the power, which will determine how many HR result from Deep! rolls. So, I need to get a handle on how power affects those probabilities. Later, I can make calculations based on Deep! 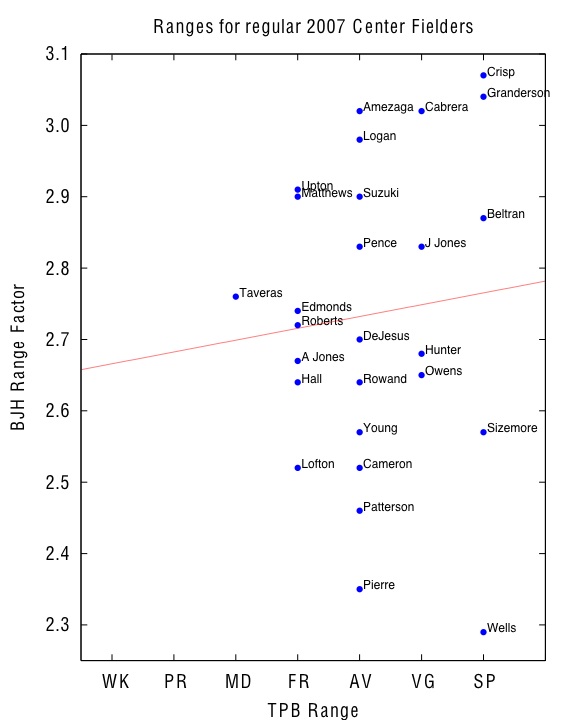 ranges, either averages or against particular pitchers. I wrote a “Deep Engine” that captures the location and distance data and allows me to run some Monte Carlo simulations. 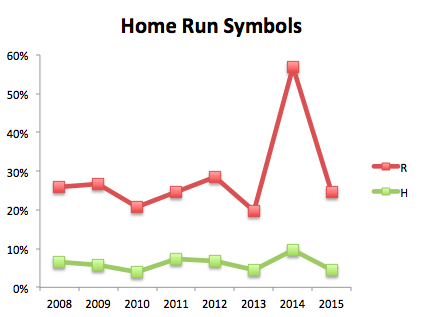 For now I’m going to ignore robbed HRs, which is a pretty small effect. For the first calculation I’ll assume a random distribution of pull types (Lsp, Lp, Rsp, Rp) and use all the 2006 parks. (Later I should whittle it down to the 2007 parks in the ABL.) I ran ten million trials for each power rating and came up with the following probabilities. So a power-5 guy has about a 50% chance of hitting it out on a Deep! The average power-1 batter is more likely to send it foul than over the fence fair.